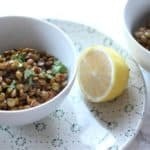 Place lentils in a medium-sized pot, with 2 cups of vegetable broth. Cover, reduce, and simmer 20 minutes or until lentils are just tender. Note: Make sure your lentils are tender! Ours were still firm so I added more broth and cooked longer! Heat olive oil in a medium-sized skillet, over medium heat. Add chopped garlic cook for 1 minute, until fragrant. Stir in tomato sauce, remaining vegetable broth, lemon juice, salt, black pepper, ginger, cumin, turmeric, paprika, garam masala, and cooked lentils. Garnish with chopped cilantro when ready to serve.